There are few lists of the best films of all time that receive more scrutiny than the American Film Institute's (AFI) 100 Years... 100 Movies list. Released in 1998, the rankings were voted on by 1,500 "leaders from across the American film community." These are English-language films produced by American studios, so that creates a more limited group than the Sight & Sound list. An updated version was released in 2007 with 23 different movies. I don't place much stock in the specific slots, but it does provide a general framework for notable classics. I recently discovered that I've yet to see eight of the 100 movies. This marathon won't include all of them, but it will help to minimize that number. Even when you consider all the flaws, I still believe film fans should see these choices. 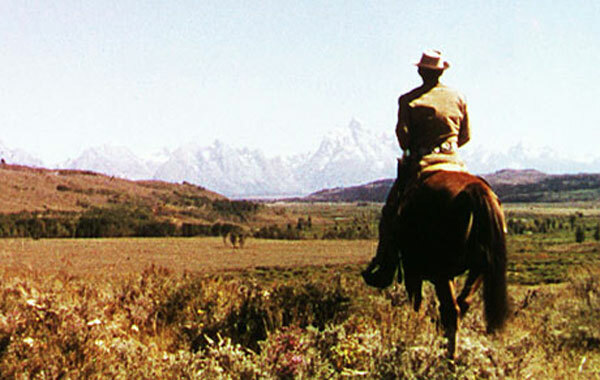 My first pick is George Stevens' western Shane, which appeared at #69 in the 1998 list. Amazingly, it moved up 24 spots to #45 in the anniversary edition. This movement shows that it's still relevant to many industry folks more than 50 years after its release. So, what's this story about? Joe Starrett (Van Heflin) is a homesteader in Wyoming trying to set up a life with his wife Marian (Jean Arthur) and son Joey (Brandon De Wilde). He's facing pressure from the cattle baron Ryker (Emile Meyer), who will do anything to evict him. 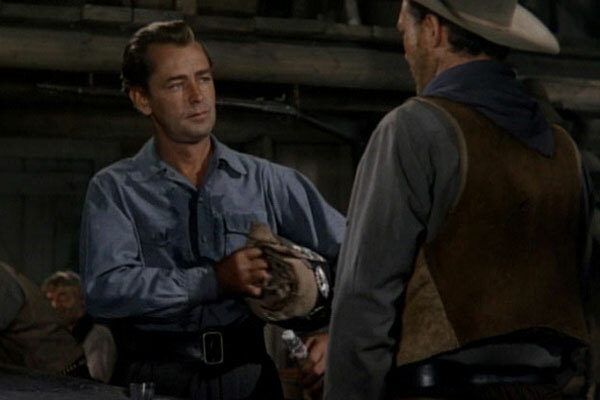 A mysterious gunfighter named Shane (Alan Ladd) arrives and strikes up a friendship with the Starretts. When Ryker hires the nasty mercenary Jack Wilson (Jack Palance), the stakes go up for everyone who's holding out. Shane must decide if he's willing to stand up for his new friends and go back to his violent ways. Young Joey is obsessed with guns and adores Shane, and he doesn't understand why he's hesitant to use violence to solve their problems. What are the key themes, particularly in terms of the American culture at the time? Shane delves into the traditional genre concepts, particularly the loner from the wilderness stepping up to save civilized folk. The story takes place in the late 1880s, so the glory days of the Old West have passed. Outlaws like Shane and Jack Wilson are relics, and the brutal rule of men like Ryker can only last for so long. The powers of the industrial age will arrive soon, even in remote areas like Wyoming. 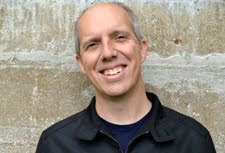 Like Joe Starrett, they can't compete as individuals with the gunfighters, but their forces will change the culture. Joey may admire Shane for his shooting skills, but those talents are limited. When this skirmish is over, there's no place on the range for the men who fought to preserve it. Why has this film maintained its status while so many others have faded away? This is tricky because it doesn't seem as unique as other westerns on the list. Shane is an interesting character, and watching him support the Starretts is a strong moment. However, it isn't clear why it's received such acclaim from the AFI. I think it's the case where a few iconic scenes are enough to overtake a generic plot. For example, Roger Ebert reads a lot more into the character of Shane and the issues lurking beneath the surface. 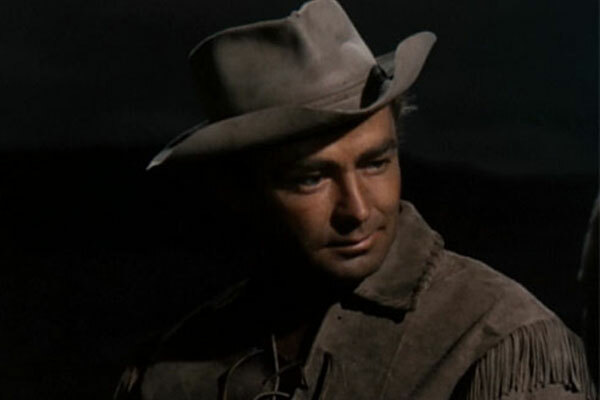 He makes excellent points, but it still feels like a reach to inject greater complexity into Alan Ladd's mysterious face. This story could be familiar because so many other movies have explored similar themes in more recent years. That isn't the fault of this film, yet I still get the sense that some critics are looking for more in Shane than what's actually there. Are the characters believable and fully drawn? This answer varies dramatically based on each character. Ladd does a good job as Shane because he leaves questions about his background unanswered. He seems too nice to actually be a vicious killer, but it's clear he's suppressing past demons. One of the better scenes involves his visit to the general store. When he stops by the bar, the massive Chris Calloway (Ben Johnson) throws a drink on him and tries to pick a fight. Shane refuses to take the bait and slinks away, and it's telling to watch him swallow his pride. When he stands up and fights Chris later, it's a brutal scene that supports his initial hesitance. Villains like Calloway seem like one-note foes, but Johnson keeps him from falling into that trap. Even he recognizes that Wilson is a deranged killer and warns Shane of where this conflict is headed. On a different note, Joey is a key figure in this story because he only sees the idealized version of Shane. 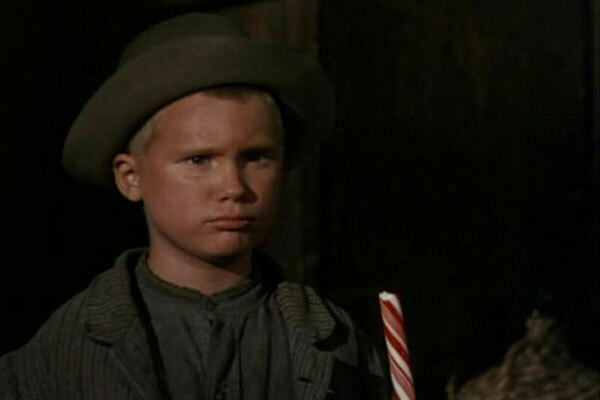 The problem is that Brandon De Wilde's acting is extremely limited. I understand that he's not a terrible actor, but we keep seeing shots of him with the same facial expression. The entire story hinges on Joey's feelings about Shane, and that connection isn't as sharp because he's a more generic character. What are some of the most memorable scenes? I can't discuss Shane without mentioning the ending, which includes the famous "come back, Shane!" line from Joey as he rides away. After dealing with Ryker and his goons, the title character is ready to depart this "civilized" land. We aren't given a clear reason, but he's likely fleeing once again from the violence that seems to follow him everywhere. He's made a bond with the Starretts and might even be in love with Marian, but that isn't enough to keep him with them. Even more interesting is his brutal hand-to-hand fight with Joe, who wants to go into town and challenge Wilson himself. While Shane might appear to go overboard, there is a reason for this battle. Van Heflin makes Joe such a likable guy that it's hard to see him get pounded, even when the result will help him survive. Understanding that any list is subjective, does it deserve a spot on the AFI 100? While I admire a good part of this film and it's place in the genre, I'm going to have to say no. When you consider the fact that Red River, Stagecoach, and The Man Who Shot Liberty Valance aren't even on the list, it's hard to put Shane above those movies. I agree that it deserves to be mentioned among the more influential westerns of all time, but it's a pretty conventional film. I didn't feel the same connection to this story that I felt with those other pictures. 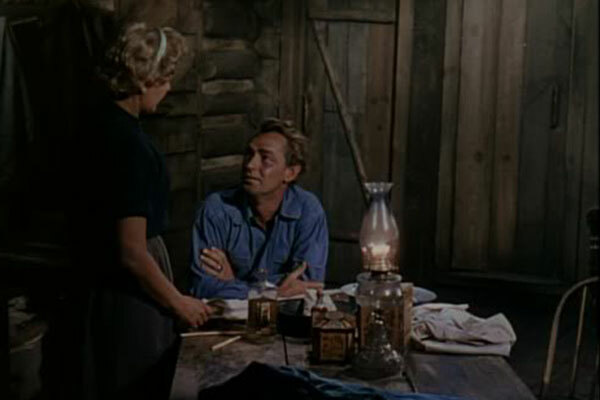 George Stevens (A Place in the Sun) is a talented filmmaker and creates an interesting look for this film. I'm glad that I finally caught up with this acclaimed film, though I'm not ready to crown it as one of the greatest examples of its genre. Next week, I'll take the stage and check out James Cagney in Yankee Doodle Dandy. I can never think of this movie without thinking of the scene from your memorable scenes section. The film might as well be called "Come Back, Shane". John, that scene is definitely memorable and didn't disappoint. I think it ends the movie on just the right note, despite some issues in the middle. I love the film, but I agree that there doesn't seem to be much under the surface. For me, it is a fun western, but nothing more. Josh, I think it has a lot of good points. I tried to look at it without considering all the acclaim, but that's sometimes tough to do. It's a solid film for sure. I liked most everything about this film, except for the little kid. I found him to be really annoying. The ending of this film continues to generate arguments six decades later, so the movie definitely made an impact. And the popular with the younger generation film Drive from late last year is essentially a remake of Shane, so it goes to show that the story resonates with people. I agree that the kid wasn't great. I was stunned that he got a Best Supporting Actor nomination. I do think child actors were often not good in this era, and he looked strong by comparison. It also helped that he was part of the big scene. It's interesting that you mention Drive; I hadn't considered that, but it does have some similarities. Interesting post. I agree that the ending has a lot of similarities, and the lead character is definitely in a similar mode to Shane. Good stuff, Chip. The stranger arriving in town has probably been done better in Sergio Leone's Dollar trilogy, though for its time I'm sure Shane (1953) must have had quite an impact. It's a little dated today, but it was interesting to see how influential Shane was on the western genre. Plus the beautiful mountainous backdrop was stunning. 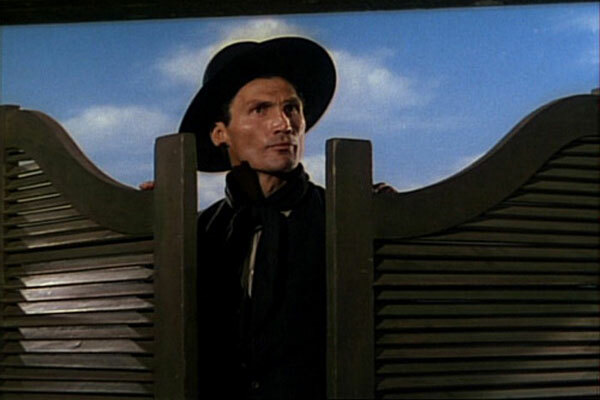 Disappointed Jack Palance's screen time was so brief, since I'd read his performance was part of the appeal. You talk about it's still relevant today to many industry folks, I guess the theme of prejudice towards a new guy in town is timeless. I also think a lot of people are drawn to the relationship with the kid, though the boy who plays him is pretty flat. That is one of the main reasons that part didn't connect as much with me. I think it's a good movie and has some great scenery like you mention, but my expectations were probably too high.